Sylvia changes many of the words I use. For example, I do not use “undocumented immigrants.” Anyone who knows me, knows I do not speak like that. I use “illegal immigrants.” Undocumented immigrants must be the politically correct term for illegal immigrant just as borrowing is the politically correct term for breaking and entering. She writes, “Larsen said Souder is wrong to advocate the expansion of ethanol because it is too costly to produce.” I never say it is too costly to produce, but rather "it consumes more energy to make than the energy content contained in ethanol". It is energy inefficient to produce ethanol. I suppose you could interpret this to mean to costly in terms of energy to produce instead of dollars. Why does she change my words? Sylvia also wrote “Larsen believes in eliminating Social Security, and Souder has “done nothing to address Social Security.” While I do support repeal of the Social Security OASI program, I at the same time support replacing it with a means tested benefit that pays $1,133 per month to each senior found to be in need based on assets. I guess she forgot that little tidbit. Why does she not want voters to know I want to help needy seniors? I worked for ten years in the nuclear industry, five years dealing with high level radioactive nuclear waste. Souder has been in congress long enough to know or should know that Yucca Mountain has not opened. That every nuclear power plant in the U.S. will be shutting down due to reaching full core reserve in less than ten years. I wrote about this in 2002. The last nuclear power plant that was designed and built was 25 years ago. All the engineers who did this kind of work are have moved onto other lines of work or retired. The U.S. does not have the ability to build a nuclear reactor today. It would take years to bring the people together, design and build the next generation of nuclear reactor. Who are we trying to kid here? We need increased electrical capacity now, not five years from now. Wind power is proven! It is one of the cheapest sources of electrical generation there is. We can begin installing wind power not a year from now, but today. It takes over ten years to build a 1,000-megawatt nuclear power plant. It would take a few months to build two hundred 5-megawatt windmills. In less than two year’s you can have windmills producing electricity. It has been estimated that the potential wind power capacity of the United States is three times the current electrical capacity today. So why go for a more expensive, longer lead-time and not environmentally friendly source of energy such as Nuclear when Wind Power is cheaper, has a shorter lead time, is environmentally friendly and renewable now? Modern day Coal fired plants are very clean, but still produce pollutants that lead to acid rain. Then there is the energy it takes to transport coal to the power plant. The problem is burning a fuel is not environmentally friendly. Drilling more oil wells will help in the short term, but it is only a crutch. We need to move away from the millennia old process of burning a fuel to perform useful work. We need a 21st century energy source that is clean, reliable and cheap. Prior to being a candidate for office I was naive in the belief that the newspaper media printed and presented the views of candidates. After being a candidate now in three primaries, I now know that this is far from the truth. Sylvia Smith called me on Wednesday. We spoke for about five to ten minutes. She asked me why I wanted to fire Souder. Mark Souder voted to increase the national debt limit to $9 Trillion. He voted for a Rx Drug bill that was projected to cost $400 Billion over ten years and now as of last week it is reported now to cost $1 Trillion over the first ten years. He voted for an Energy bill that does not address energy problems. Instead of addressing truly renewable energy sources, he continues to support the millennia old processing of burning fuels to do useful work. He supports Ethanol when in fact it takes more energy to produce one gallon of ethanol than the ethanol contains. Every gallon of ethanol produces cost the taxpayer 51 cents in the form of tax credits. In March 2005 he called Social Security a "shell game." He stated, "For people under 30 its probably going to be income based. I am not saying we're going to pass that. It will probably be passed after I am dead." He continued "If you're 40, you might make it through the system. But if you're under 40, and certainly under 30, you had better start planning because if you want to have a decent retirement you’re going to need supplemental funds." He knows there is a problem, yet does not address it. He supports tax incentives to help people save but with deficits, is this not just the same as borrowing money to invest? Mark Souder is a liberal in the sense he likes to spend money. He votes for earmarks, which is nothing more than borrowed money. Instead of voting to protect our men an women in combat with equipment that is appropriate, he votes to procure more humvees built in Indiana and takes credit for keeping jobs here. I believe our men and women in combat deserve the right equipment to carry out the task assigned them over jobs in Indiana. We have armored half-tracks paid for sitting in the desert that were procured to fight a cold war with the Russians. On immigration, Souder is wrong when he says you cannot return 12 million illegals to their home countries. There is no such thing as a job an American worker will not perform. There is no job occupation where immigrants and illegals make up more than 1/3 of the workers. If there were jobs American workers would not perform, then we should see 80 to 90% of jobs being filled by immigrants and illegals in specific occupations. This just is not the case. We have increased unemployment among the least educated American. American Jobs are for Americans first. I support finding as many illegals as possible and returning them to their country. If there are truly 12 million illegals here, that means one in 25 people in the United States is an illegal. We should be able to find many fairly easy. Every worker needs a Taxpayer Identification Number. Cross matching programs can find many if they are stealing another person’s identity. For over two decades I have solved some pretty difficult problems in engineering. I have done this by collecting data, attempting to create a base line starting point, dissecting the problem and all its nuances and then developing a theory. In many cases I create a model using the data and then project a solution based on what is desired. Well politics is anything but straight forward. People move into and out of the district. Data is basically collected once every two years and is influenced by who the candidates are. Issues play a factor on both the local and national level. I have two data points 2002 and 2004. Two points make a straight line, but few things are this simple. My web site over the years has gotten a fair number of hits. Blogging has also helped refer people to my web site. Newspaper coverage in 2006 in northern Indiana covering the candidates has been especially good and on a level playing field. More people have helped out with my campaign this year than in 2004. In addition posting on other blogs where others write about me (negatively or positively) is an unknown factor. The number of unique hits other blogs receive will have an impact, but again is an unknown factor. Candidate forums such as Northside High School were especially good with four to five times the number of attendees (not candidates) showing up to hear candidates and ask questions over past years. With this said, I have presented the issues I think are important. It is up to you the voter to cast a vote on May 2. Do we continue with ever increasing deficits and unresolved problems that are decades old or do we move forward and restore the American dream where in a land of opportunity an individual can work hard and prosper? I ask for your vote on May 2. Please contact two people and speak with them about my issues by May 2. Enjoy your weekend. The News Sentinel reported that Mark Souder said "I don’t intend to have debates in the primary where, in effect, the other candidate isn’t a serious candidate,” Souder said. “Larsen doesn’t have any money." Is Souder implying that money is more important than issues and ideas and that he can buy your vote? Each candidate was asked by the News Sentinel to list three issues important to them. In addition the News Sentinel has published their Candidate Guide. I ask for you vote May 2. "Larsen believes the government should get out of health care completely. "Health care is a personal issue; when government gets involved, they shift cost to others," he said. "All we're doing is we're creating two groups of people -- those who are paying for it and those who are getting a free ride." He does think the government should require people to have catastrophic health insurance, similar to car insurance requirements." "Souder said developments like the Medicare Part D prescription drug benefit program will help drive down costs through the private marketplace. He thinks other steps could be taken to encourage that -- like allowing associations and other groups to pool together for insurance and for insurance policies to be portable from job to job. He said the Medicare changes dropped drug prices to within 10 or 15 percent of those sold in Canada and doesn't yet support reimportatation. "If that gap doesn't narrow, maybe even by next year ... you'll see us open that up because the pharmaceutical companies are not responding to the market." The Rx drug program was projected to cost $400 Billion initially. Then after it was passed the CBO increased it to $540 Billion. Two days ago I saw that they now estimate it at $1 Trillion over the first ten years. The March deficit (one-month) was $85.5 Billion. This most likely is a unified budget number, which means they included social security and Medicare taxes and credited interest on the trust funds. The general budget deficit is most likely very close to $100 Billion or $1.2 Trillion annualized. It would be nice to be able to provide everyone with healthcare any essential an individual needed. However, the fact remains that to do this costs money, your money and affects your family's standard of living. It is immoral and un-American to borrow money, reap the benefits now and give the bill to our children. If we as Americans want some government program we should have the guts to pay for it. If not then that program needs to be repealed. WBOI's asked me to leave succinct responses to three questions. I did and they aired them on Tuesday. 1 What motivated you to enter the race or run for reelection? I do not like the trend in our government spending. In 2005 our representatives spent $553 Billion more than we paid in taxes based on a unified budget, which includes social security and Medicare but in terms of general budget, it spent $726 billion more. The March 2006 deficit was $85.5 Billion an annual rate of $1 Trillion! We now have Katrina and a new Rx drug program. They add more programs while we cannot pay for the ones we already have. Social Security is broke, the Social Security Administration for the past nine years has been saying they are working on resolving the funding problem, but are no closer to a solution than in 1937. I love my country and I want my children, your children to do better. If we want some service or program, then we the people should have the guts to pay the taxes to pay for them, not borrow the money, reap the benefits and give the bill to our children. This is immoral and Un American. 2 What makes you the best candidate? I know how to budget, I do my own taxes, I am an engineer who understands balancing equations so things work. I am a veteran who served his country and understands first hand what veterans go through when they go to the VA hospital. I know the hardship of military life and will support our military. I understand energy and immigration. I analyze data and solve problems for a living. I know more about Social Security than any other candidate. If you want it fixed, I have a plan that will work and we can do it. 3 What would be your main priority if voted into office? Stop passing new legislation to spend more money or create new programs until we have fixed the current ones we have. All legislation needs to require accrual accounting, the same as required by business. Not the Enron style accounting that government currently uses today. Educate the public on Social Security and the need for reform. Doing these things will make it possible to balance the general budget and to restore the American Dream. Here is an email I recieved. Thank you for taking our request seriously and calling us with your answers. At what point will it be feasible for U.S. troops to return from Iraq? "Larsen: I could say this fall, but would that be realistic? It may make you happy and it may be what we all would like to hear, but it most likely would not be honest or realistic. I served my country in the U.S. Navy. Life is unpredictable. The information that you and I have gotten has not been totally above board, so who is in a position to know when it might be feasible to have our military men and women come home? I believe the No. 1 priority now is to ensure our men and women have the best equipment and training to carry out their assigned tasks. And on an equal level, ensure those who have sacrificed much be taken care of to the fullest extent possible. If elected, I will move to bring them home as soon as humanly possible and ensure they have the best equipment and training to minimize our casualties. Rest assured, I will strive to make sure those men and women who sacrifice much in terms of causalities will be taken care of to the best of our ability." "Souder: Our brave men and women in uniform -- and their families -- have made tremendous sacrifices to ensure that we can be safe back home. They understand that Iraq is part of a global war on terrorism. On Sept. 11, 2001, al-Qaida struck us here at home and our soldiers are fighting in Iraq, Afghanistan and elsewhere to help ensure that Islamic terrorists are not able to attack us again. Oceans no longer offer us the protection that they once did and we are now forced to confront threats before they come to us. I visited Iraq in March. Our commanders and the Iraqi government all said that by this fall we should be able to withdraw at least 20,000 troops (unless sectarian violence becomes far greater than it is currently). As the Iraqis take more and more control of their own security, I expect withdrawals to continue. But the world has a large stake in a stable Iraq and it is likely that significant numbers of coalition forces will remain for many years, as we have in Germany and Japan." Earmarking in the budget has led to many pork-barrel projects throughout the country. Should Congress end this practice? Why or why not. "Larsen: There are two sets of books our politicians like to keep, the general and unified budgets. The unified budget includes every government expense while the general budget excludes Social Security and Medicare. Politicians like to use the unified budget because they can show a lower deficit number. In 2004 they passed a unified budget resulting in a $553.6 billion deficit. Excluding Social Security's dedicated cash surplus, the general budget deficit was $726.1 billion. There was Katrina and now we have the Rx Medicare drug program. The deficit this year is going to be over $800 billion. Interest on the debt is over $450 billion or 40 cents of every dollar we pay in federal income taxes. The problem is, they could eliminate the unified budget deficit and still have a very large general budget deficit. We need to eliminate earmarks, require each bill to cover one area and one area only, and we need to prevent politicians from inserting language in the bill at the last minute without anyone's knowledge. The reason is simple: Congress cannot say no to anything. They cannot budget and they keep buying votes with our money. The simple answer is we cannot afford earmarks." "Souder: Without specific set-asides in congressional funding bills for local projects (such as C.R. 17), I believe that those of us in north-central and northeast Indiana would see our taxpayer dollars sent by bureaucrats in Washington to other states, or within Indiana, to Indianapolis and Lake County. Congressional earmarks allow us to return our tax dollars back home through our elected representatives and I support the practice. I will support restrictions on the number of earmarks and more fairness in their distribution. I have always been open about the earmark requests that I have made. I believe that all members of Congress should have to reveal their requests, which is why I'm an original cosponsor of H.R. 4964, the Earmark Transparency and Accountability Act of 2006. This bill would prohibit the last-minute insertion of earmarks in conference reports by requiring any earmark to have first been included in the House- or Senate-passed version of the bill. It would also identify which member of Congress requested each earmark and the earmarks would be available to the public on the Internet at least 72 hours before the funding bill's consideration." The Social Security program will collapse for younger generations if the federal government doesn't step in and make it solvent. What should Congress do to ensure that those who are paying into the program will get something back in the future? "Larsen: Since 1983, Social Security has been working on resolving its latest funding problem. It is no closer to a solution now than it was in 1937. Social Security has earned 8.6 percent compounded continuously since 1980, but as a middleman, will pay you a 0 percent return. It's a dreadful value. There is no painless solution. The best young workers can do with Social Security is to be paid 29 cents in benefits for each $1 in taxes paid. Raising taxes, retirement age or cutting benefits will not change this fact! I propose workers retain what was the Social Security old age tax paid by employee/employer in their own accounts. We use the current $1.65 trillion in the old age trust fund to pay a means-tested benefit of $1,133 per month to each senior in need. After 10 years, the trust fund will be exhausted. Taking care of those in need is not just a worker's responsibility, but everyone's. In year 11 we use general revenues. After 37 years, about 9 percent of seniors will need assistance at any given time. Young workers would see what used to be the payroll tax of 10.6 percent replace 90 percent or more of their wages in retirement compared to 25 percent payable under Social Security." "Souder: Originally designed in the 1930s, the Social Security system will not be able to keep up with future changes in our population. The system is already financially broken and it will start going bankrupt in 2018 and be completely bankrupt just decades later. The current program is unsustainable, and we should not wait any longer to fix it. Hoosiers have a right to a safe, secure retirement and they should have a say in how their savings are invested. Our government made a promise to Social Security recipients and I am committed to upholding that promise. Thus, any changes we implement would not affect current recipients or those who are near retirement. For younger workers, however, I believe that we could strengthen their Social Security system with the creation of personal retirement accounts. These accounts would allow Americans to invest a portion of their payroll tax. A successful retirement savings program already exists for employees of the federal government. It's called the Thrift Savings Plan and I believe that a similar program should be available to all Americans. " Congress has recently been wrestling with the issue of immigration reform. What should the U.S. do to properly balance open borders with cracking down on illegal immigration? "Larsen: The perception is we are in need of less-educated workers, which is not true. Steven Camarota, research director for the Center of Immigration Studies, says our infrastructure suffers from illegal immigration and we pay for it in our schools and health care. Data clearly shows immigrants do not perform jobs that Americans won't, but displace the least-educated Americans. Unemployment among less-educated Americans (high school only) is up 11 percent, while 13 percent for dropouts. In 2005, there were 4 million Americans unemployed and 19 million who stopped looking for work. The share of unemployed with less education is way up. They already have the highest unemployment rate, lowest wage rate and employment participation among less educated has declined dramatically. They took the poorest workers and made them poorer. Less-educated immigrants and less-educated Americans do the same kinds of work. Allowing legal status to illegals has enormous implications for America's poorest workers. America is not short of less-educated workers given the high unemployment rate and the high number of less-educated workers who have stopped looking. Immigration is not bad; uncontrolled/illegal immigration is. We need to know who is entering our country to deal with terrorism. We need tighter border security." "Souder: As a senior member of the Homeland Security Committee and as the author of the first comprehensive congressional report on border security, I know that first and foremost we need to do more to enhance our protections along the border. In addition, we need to adopt a guest worker program (which would likely include a path to a Green Card and citizenship for some workers) and then ensure that our immigration laws are enforced. Morally speaking, I do not believe that we can make use of illegal workers when times are good and then cast them aside when things aren't going as well. Moreover, it isn't realistic to deport 12 million people. America is a land of immigrants and we need a fair way to accommodate those whom we need to keep our economy functioning and growing. But we must have a secure, enforceable border, which in the past Congress has refused to mandate. At the same time, we must be fair to those who are waiting patiently to immigrate -- sometimes for decades." The News Sentinel had a short article on young voter turn out. Why don't young voters vote? "One of the main reasons young people gave for not voting was that they felt ignored by politicians. " I have been saying this since I first voted in 1974. I have always felt that candidates were buying votes using my money. They got away with this because young people did not vote. The reason why young did not vote is answered above. It is a catch-22. I hope to break this cycle. I offer young voters an opportunity to free themselves from Social Security, the single largest tax most workers pay. I offer them 10.6% of their wages back. What do you have to loose? Are you willing to spend a few minutes to vote in exchange for an opportunity that could very well increase your standard of living by 10.6% now and by 100% in retirement? Rather like a lottery, except the odds with me is a whole lot better. Can you just say no to two more years of government spending, over taxing and mismanagement? If so vote for William Larsen a father of five who wants to restore the American dream where in a land of opportunity, an individual can work hard and prosper! Choose to vote in the Republican Primary and cast a vote for William Larsen. Tracy Warner posted on his blog "This year, we saw no need to interview William Larsen, who is making his bi-annual run against Mark Souder, or David Roach, who is making his regular run for office -- any office." Well that clears that up. 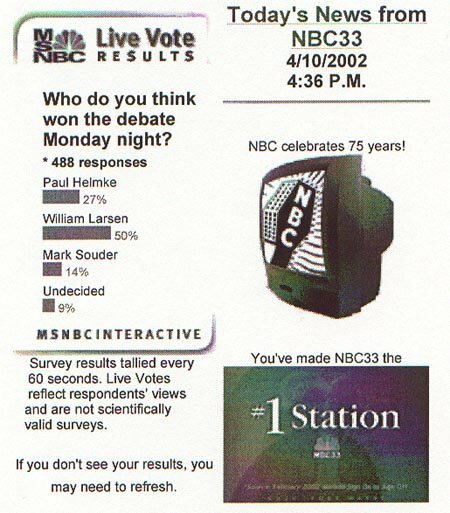 In 2002, 3% of the voters supported me. In 2004, 21% of the voters supported me. On May 2 we will see how large my support has grown. I spent six hours at IUPU Monday and spoke with well over 50 different individuals. Some came back an hour or two later to ask more questions. One individual thought it was neat that an actual candidate was out speaking with the public and said all candidates should do this. I handed out all my copies of "Snookered" which is my mini series on Social Security. I am now looking at shrinking it down to place on my web site so all can look at it. I handed out well over 1,000 fliers and buttons. Out of all the people that passed by, less than 20 would not take a flier. Some democrats even asked if they could vote for me this primary. In this primary you will be asked if you want to vote in the Republican or Democrat primary. If you are a democrat, but wish to vote for William Larsen, all you need to do on May 2 is say you wish to vote in the republican primary. I will be back at IUPU on Tuesday and Wednesday. On April 29 at 4:30 PM the Libertarian Perspective will be showing Doug Horner's inerview with Bill Larsen. Access TV channel 57 has been airing “Snookered.” “Snookered” is a half hour show that explains Social Security starting with the history, initial promised benefit and tax rate and ending with a discussion on seven different proposals that have been looked at to fix social security. The mini series consists of five half hour shows. I have been told it is generally on at 8:00 pm. I have a DVD of the first four episodes. I should have a copy of the fifth show shortly. If anyone is interested in a copy, please call me at (260) 637-0741. Both the Journal Gazatte and News Sentinel had an editorial in my support. What does a World War II memorial of vehicles used during that war and a highway named for Ronald Reagan do for the future of Indiana? I am also in the dark regarding lighthouses. Time and money spent on frivolous items are an insult to the hard-working voters of this state. The voters of the 3rd District should wake up and vote for someone who knows what they are talking about, someone who understands numbers, someone who is not running for office for his own personal glory or gain, someone who is honest, trustworthy and concerned for future generations and the future of this nation. Someone is needed who will not sugar-coat the facts and sidestep issues just because they are not popular, someone who will do what he says he will do and not “change his mind because of redistricting.” That someone is William Larsen. This nation faces many problems, Larsen is a problem-solver of long standing. He lives in the real world where people are laid off and have families to support. 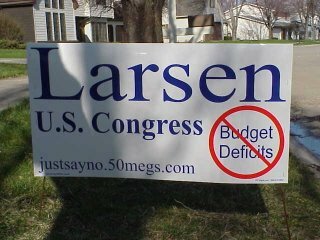 Cast a vote for your country and for Larsen for U.S. Congress. I will be at IUPU on April 24, 25, and 26 from 10:00 am to 4:00 pm speaking with students and handing out fliers. Expand Carroll H.S. or Build a New H.S.? How many in Northwest Allen County School’s know the proposal for Carroll’s expansion may actually cost far more than building a new high school? I learned at the Candidate’s forum for School board that the proposed expansion would increase capacity to 2800 students. I was told current enrollment in the main campus was 1,500 and about 600 at the freshmen campus for 2,100 overall. The new expansion would increase capacity by 700. A new school was estimated at $100 Million. To decide which is the best route is done by looking at cost per student. A $100 million new H.S. with a capacity of 1,500 students costs $66,667 per seat. An expansion costing $60 million and adding 700 students costs $85,714 per seat. Expanding Carroll will create a dilemma in the future similar to what New Haven High School experienced where the old building was built in 1909, the second portion built in the 1950's and a newer wing in the 60's. You had three separate areas of different ages combined. When looking at useful life of a building you want the entire thing to fail at the same time. Otherwise you have un-recouped capital infrastructure commingled with un-usable infrastructure. With Carroll, a large portion of the cost is to build a new gym where all students can be assembled. It has been expanded in the past where new gyms were built to accommodate increased capacity. Another expansion will add a new larger gym. The problem is the useful life of the older gyms have not expired and we are paying on those bonds now. In essence we will now have three bonds we will be paying on where two of the gyms will not be used to accommodate all students at one time. The original justification is no longer valid after a new gym is built, but payment is still required. Without too much information to go on, it looks like the expansion is a stopgap measure at best. Because they use cash flow accounting, it looks cheaper now. However, under accrual accounting it is a very expensive route. With cash flow accounting, the cost of paying for the building decreases yearly. This makes it appear to cost far more up front. Under accrual accounting, you amortize the true cost over the life of the building, escalating the cost to taxpayers yearly based on inflation. This reduces the cost up front on the original tax base and uses the increasing tax base on a yearly basis to level the tax rate (no increase). In this way the tax rate remains constant and the only increase in property tax is the result of increased property values. If you do not do this, the tax rate will rise again and again and again even after increased property values are taken into account. A meet the candidates took place in Lagrange Tuesday night. Mark Souder was there. A retired sheriff asked a question on immigration. The sheriff stated that 30 years ago they would pick up illegals and call immigration and the illegal would be picked up and sent back to their home country. However, about 20 years ago immigration stopped picking up illegals and the sheriff department stopped looking. Souder’s position is a fence; virtual fence or boundary must be put in place, but that placing 200,000 troops along the border was not feasible. He also stated it was not feasible to send 12 million illegals back home. In addition Souder stated sending them back home with Indiana’s lower 4.7% unemployment rate would cause worker shortage in jobs Americans do not want to do. Reverend Boyd said it would not be Christian to send them back. It is not Christian to break our laws either and then demand we accept them either. The Christian thing is to help them help themselves in their own country. Do we not already provide aid to Mexico and other countries? Well I disagree with much of what Souder stated. There is no such thing as a job an American will not do. In the most concentrated work classifications, which there are 35, there is not one classification where immigrants or illegals make up more than 1/3 of the work force. In addition within these 35 work classifications there are 5 million Americans employed. If there were jobs that Americans would not do, then the data would show very clear job classifications where immigrants or illegals made up 80 or 90% of all the workers within that classification. THERE ARE NONE!!! There are 14 million less educated Americans who have stopped looking for work. The unemployment rate among high school graduates has increased. It is illegals who have taken these jobs from Americans because they network better among themselves than do Americans. I believe that if you start with a defeatist attitude you will fail. It may be true we cannot find all the illegals, but I bet we can find a lot. I bet we can within two weeks find half of all the illegals. I bet within a month we find another 10 to 20%. The thing that irks me is they have known about this for a long time. Souder infers we need these workers otherwise our economy will suffer. This is what Steven Camarota, Research Director for the Center of Immigration Studies, referred to when he said they look the other way when it comes to illegals to support immigration. Instead of addressing problem when they are small, they sweep them under the rug, look the other way or create action committees to study it to death. I say begin sending them back now using current law. Begin building a fence in the most accessible areas. Make them work to get across. I attended the Northwest Allen County School Board Meet the candidates at Perry Hill elementary last night. One question from the audience was about how Mike Sylvester's answers were more business than education oriented. Mike focused on Budget and the questioner was concerned about education. The School Board should focus on financing and let the administrator focus on education. You need good financing and practices to ensure a good education. Mike repeatedly brought up the lack of planning in terms of five and ten year plans. These plans would cover when a new school would be needed, what projected maintenance costs would be over the life of the school, how large an enrollment should be in anyone school and more. Mike is a planner. He looks at costs with accrual accounting. That is you factor in the total cost of the school which includes heating & AC, new roofs, maintenance, the building of the school, grounds care, teachers & administrator pay and all costs associated with this school. You then factor in how many students will be attending the school in any given year and how much revenue you might receive from the state and federal government for each student. In the end you end up with a cash flow that is not linear, but has spikes and you project a constant level tax rate to cover the total cost. What the school board now does is obvious. They use cash flow accounting. They look not into the future, but look at only today and the money coming in and going out. What this does is spread the construction cost of a new school out over 30 or 40 years (issue a bond), but not factor in routine maintenance costs. For example a new roof will be needed every 15 to 20 years; new heating and AC every 10 to 15 years; paving the parking lot every nine years; painting the building every five years; and the list goes on. What happens it appears you have little cost after you build a school, but with each passing year you consume the life of some items and thereby accrual a cost for replacing them each and every year. Under cash flow accounting you end up with incremental tax hikes. Under accrual accounting and using plans, you can get a better handle on costs. Carroll High School was built with a utilization rate of 85% capacity. This means that when enrollment reached 85% capacity, the school was revenue neutral. When Carroll reached 100% capacity, the school system had 15% more revenue than needed to run Carroll. My question is what happened to this 15%? It should have been set aside to pay for a new school or addition. Accrual accounting is the way to go. Mike Sylvester has the background, logical thinking and is a problem solver to get Northwest Allen County Schools moving in the correct direction. I support Mike Sylvester for School Board. Larsen proposed repealing the automatic retirement benefits of the Social Security Act and using what's left in the fund for people with no other significant assets. "We exclude approximately half the beneficiaries today from collecting benefits," he said. "I expect people to be able to provide for themselves before they ask for help from the rest of us." Instead of Social Security taxes, employers would put that money into IRAs for employees. Employees would keep the money they were paying in Social Security taxes as they see fit. Souder expects Social Security to become a "capped benefit" where future benefits are given only to those below certain income levels. He said the solution is for people to start private retirement accounts and savings plans. "What can we do taxwise to help encourage more people to set aside more money?" he said. "The pension systems ... need to reward people and create an incentive to earn additional income" after they reach "retirement age." Smith proposes no changes to Social Security, other to having the government cease dipping into the fund for other things. "I think Social Security will be just fine if politicians keep their hands out of it," he said. The more they mess with it, the worse it gets." Hayhurst and Boyd propose some changes to save Social Security, also calling to "lock up" the fund like Smith. They both propose having high-income people pay more into the fund right now since Social Security taxes hit poorer folks harder. Hayhurst also thinks the government should promote private savings and investment, but not by privatizing Social Security. Boyd also calls for doling out benefits to people based on what they otherwise have in reserve, so poorer people get the aid they need. More workers pay more in Social Security Taxes than Federal Income Taxes. Social Security has stated for the past nine years in writing they can pay but 73 cents on every dollar promised. The amount of social security old age tax each worker pays would pay that worker over 90% of that workers pre tax payroll adjusted for inflation for life starting at age 67. Here we have Souder's statement he believes it will be means tested in the future, but basically wants you the worker to save more using tax incentives, but wait in March 2006 they reported an $85.5 Billion deficit. In essence he wants to borrow money so you can save more - not smart. Then we have Dr. Hayhurst and Reverend Boyd who want to stop spending the surplus and place it in a lock box. I guess neither of them realizes the Social Security Trustees assume the Trust Fund will be paid back in full with interest already and it still cannot pay scheduled benefits past 2041. 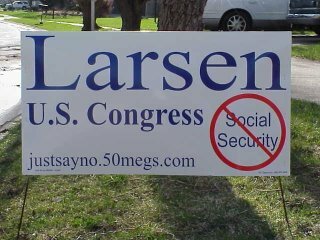 Larsen admits there is no painless solution and allows you the worker to keep your Social Security taxes and what your employer is paying as well. This is on average $3,600 per year. Means test benefits based on assets now. Souder says to borrow the money to allow for tax incentives so you can save. Cap benefits and means test in the future. What is his plan to pay back this borrowed money? Is it interest free? Hayhurst locks up the surplus in a lock box and asks you the worker to save more while paying social security taxes. The choice is yours. Those under age 46 out number all other voter groups combined. The News Sentinel had this to say in the Monday Evening Paper. "William Larsen, a structural engineer who has broadened his approach enough so that he no longer deserves the “one issue candidate” label he got stuck with when he first ran as a fierce opponent of the current Social Security system. He lists his top priority, for example, as national defense, and he has keen insight into some accounting tricks the federal government uses to keep the budget so bloated." I would like to make one correction, I am a Mechanical Engineer, not a Structural Engineer. The Lagrange County Chamber of Commerce is hosting a Candidate forum and that all candidates for the May primary were invited. Mark Souder is reported to be attending this one. It is located at the Lakeland High School in the cafeteria. Starts at 7:00 pm. I will have some fun. It is located 0805 East 75 North. Did Journal Gazette Libel William Larsen on April 15, 2006? Libel - a written or oral defamatory statement or representation that conveys an unjustly unfavorable impression. statement or representation published without just cause and tending to expose another to public contempt . defamation of a person by written or representational means. the publication of blasphemous, treasonable, seditious, or obscene writings or pictures. the act, tort, or crime of publishing such a libel. The Journal Gazette wrote "Larsen is a one-issue candidate with an unrealistic and incomprehensible plan to abolish Social Security. Larsen has run in the last two GOP primaries with the same campaign platform."? The Journal Gazette has neither interviewed nor spoken with William Larsen in 2006. In 2002 and 2004, William Larsen provided Tracy Warner with written documents identifying issues other than Social Security. 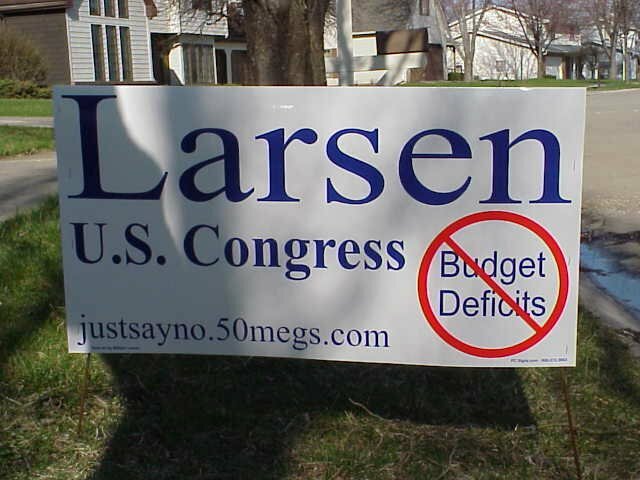 In 2006 William Larsen has a new campaign sign identifying a second issue, Budget Deficits. Tax Reform: Americans and Business spend too much on determining their taxes. Why should one company profit at the expense of another simply because a politician wants to give your money away? Individuals and business would do better understanding the tax code and knowing the tax code would not change every few years. Congress has given preferential treatment to companies groups and individuals. This is unfair, creates thousands of pages of cod and is inefficient. Income is income, treat income as such. Treat all taxpayers fairly by not holding out carrots for preferential tax treatment. This will reduce the tax code to less than 50 pages. It will greatly reduce compliance costs and tax court litigation. You can read William Larsen's published Editorials. I heard the Deficit for March 2006, a single month, came in at $85.5 Billion. On an annualized basis this is over $1 Trillion a year! It is time for a change. We do not need anymore earmarks. We do not need anymore new programs. It is time to Just Say No to Budget Deficits! If we want government programs and services, then we as Americans should have the guts to pay for them. It is immoral and un-American to borrow money to pay for the things we want today and pass the bill onto our children. Our children will have their own needs and bills in the future to pay for without us adding to them. There are many more papers asking Candidates for U.S. Representative questions than ever before. In the past it was just the News Sentinel and Journal Gazette. This year The Goshen News, Albion, The Elkhart Truth, Indianapolis Star and Noblesville Courier have all asked me to fill out questionnaires. I believe this will help get my message to even more people than in the past. The Journal Gazette however has not asked me any questions nor asked to interview me. The News Sentinel has posted each candidates response on their website. I attended the Southwest Conservation Club on Wednesday and spoke to the Association. Afterwards an older woman asked me point blank what my position was on Social Security. I told her that my plan was to help those who needed help, while those who did not need help would loose their Social Security benefits. She listened to what I had to say for a good five minutes. I covered how the program began such as the payroll tax being just 2% when Commission Altmeyer stated it should be closer to 7% of payroll in 1944. She had known a lot about Social Security, but had never before correlated all that she knew. She told me she lives on Social Security and that it was her sole source of income. I explained to her my plan would pay her and any other person found to be in need $1,133 per month. This would be indexed by the change in the U.S. Average Wage, not the CPI index. This change in indexing would maintain the standard of living of the person in need with that of the economy. The CPI index only maintains the ability to buy those goods and services that were in the “basket” when the CPI index was calculated in the year they began drawing benefits. This person told me her Social Security was just around $834 a month. Under my plan she would see an increase of just about $299. In the end she accepted the fact Social Security was broke, that something had to be done and that continuing it was unfair for her children and grandchildren. In the past two primaries, the Journal Gazette has sent me a letter requesting an interview. In past I have met with Tracy Warner and answered his questions. This year I have not received an invitation but I have heard that the Journal Gazette has interviewed the other Candidates for Indiana's 3rd U.S. Representative. In the past I have presented my issues in writing so that there was no misunderstanding where I stood on issues from Abortion to Terrorism, but I always was referred to as a one-issue candidate. I guess the Journal Gazette considers my issues and campaign a waste of paper and ink. With your support I hope to prove them wrong in 2006. Tonight at 7:00 PM candidates will be available to answer questions at the Southwest Conservation Club at 5703 Bluffton Rd. Tom Hayhurst will be there, but Mark Souder has declined to show and will not be sending anyone in his place. I will be there to say a few words and answer questions. The Federal Voting Assistance Program helps our military men and woman obtain information on candidates from their states. In 2002 I was made aware of this program. Each candidate is sent a PIN number to access a recording machine. The candidate leaves a taped message that military personnel can listen to toll free. I think this is a good program and attempts to get information to our men and women in the military who are not stationed locally. I left messages in 2002 and 2004, but had not received any information this primary season. I finally was able to track down the phone number and person to call and asked about this program. It turns out that for some unknown reason a glitch in the program did not send out Indiana's envelopes to candidates containing our PIN and phone numbers. I only wish I had found this error sooner. Out of all the candidates in Indiana, not one called about this important source of information. Syliva Smith asked me why I was challenging Souder when the Odds were statistically against me. She wrote an article on the odds of defeating an incumbent. My comments are in Red. "Rep. Mark Souder, R-3rd, will be on the ballot with William Larsen, who challenged Souder in the past two elections. In the 2004 GOP primary, Larsen got 20 percent of the vote." What Sylvia did not mention was in 2002 I received 3% of the vote and in 2004 I actually received 21%, a seven fold increase with a passage of two years. Statistically what does this mean? What caused this massive increase in support over two years? Is the increase statistically significant? We will find out on May 2. Larsen said challenging Souder might appear to be slim odds, but he’s faced other uphill battles in his life and won, including surviving a life-threatening accident on a Navy ship, finding an error in his company’s 401(k) plan, convincing civil engineers that their calculations were wrong and developing his first patent. Incumbents tend to treat their challengers as annoyances – if that – rather than strong opposition. In general, a sitting member of Congress won’t debate a primary opponent. Are you tired of seeing the National Debt Limit increase year after year? Are you tired of paying high gasoline prices while our representatives pass legislation spending $45 billion on energy? What are we getting for this $45 Billion in just one year? Immigration is a mess, jobs are being out sourced and pensions are going belly up and they do nothing. They seem to have time to pass an earmark for a bridge to an island that will cost hundreds of millions of dollars where few people live, but do not have time to solve any real problems. Medicare was projected to be unable to pay projected costs past 2024, but then they pass a Rx drug program for seniors who would never pay into the program through payroll taxes and now Medicare is projected to be unable to pay projected costs pays 2019. They pass the Child No Left Behind Act and makes things worse. It is time to get Washington out of Education. Every U.S. Representative and Senator should be required to do their own Federal Income Taxes without professional help. Every U.S. Representative and Senator should be required to show they know the difference between cash flow accounting and accrual accounting and to pass a basic math test. Instead of creating new programs, why not fix, change or repeal existing programs? We need to get back to basics. I ask for your support May 2. Immigration & Jobs Americans Won't Do! I heard on the radio last night the comments from a religious leader say that immigrants help the economy. I heard another state that immigrants do jobs that Americans won't. I heard this morning that many illegal immigrants who had children born in the United States say they do not want their parents sent home. The media likes to interject a few basic 10 to 20 second sound bits and then ask bystanders questions. It would not be bad if the media had researched the issue. The media has not researched the issue and if they had, they would be singing a different tune so to speak. Steven Camarota is the Research Director for the Center of Immigration Studies. He spoke before a panel, which provides quantitative support against amnesty for illegal aliens as well as looking at increasing immigration. The Department of Labor and Commerce track 473 specific occupations to divide the economy. The number of immigrants counted represent 100% of legal and 90% of illegal workers. There was no majority occupation that immigrants do that natives do not. If there were, it would show up as 80% to 90% of an occupation being immigrant. There are 35 occupations where immigrants make up nearly 1/3 of the workers but these occupations represent just 7% of the total U.S. Workforce. These 35 occupations have 5 million natives employed. ½ the native born drop outs and 1/3 of the natives with only a high school education are in occupations that have 15% immigrants. Native workers face significant competition in Construction, Cab Drivers, Nannies, Maids and housekeepers where most are native workers. In 2005 there were 4 million native’s unemployed and 19 million who stopped looking for work. The share of unemployed with less education is way up. The U.S. does not have a 5% unemployment rate. The 5% unemployment rate is used to support immigration. Unemployment among less educated natives is up 11% while it is 13% for dropouts. The perception is the U.S. is in need of less educated workers, which is not true. Employment participation among less educated had declined dramatically. They took the poorest workers and made them poorer. Less educated immigrants and less educated natives do the same kinds of work. There is no such thing as a job a native will not do. Allowing legal status to illegals has enormous implications for America’s poorest workers. America is not short of less educated workers given the high unemployment rate and the high number of less educated workers who have stopped looking. The Social Security administration has updated its tables on the Social Security Disability (DI) program. In 2005 it collected $86.077 Billion and paid out $88.018 Billion for a negative cash flow of $1.941 Billion. The Social Security Old Age Survivors Insurance (OASI) Collected $506.9billion and paid out $441.9 Billion in benefits. Since 1937 workers have paid $8.4 Trillion into OASI and OASI has paid out $7.7 Trillion in benefits. Total surplus taxes over 69 years total $659 Billion. If you divide this surplus by the total of 160 million workers, you would get $4,117 each. Now does anyone doubt now there is a problem? Add in interest earned on the trust fund and the balance is $1.663 Trillion. Note I do not include interest credited to the trust fund. The reason is very simple. Under accrual accounting, we are interested in setting aside enough resources today to cover the present value cost of all social security benefits earned in 2005 based on the wages earned. The interest earned on the trust fund is meant to do "work" and ease the burden. If you start saving early, the amount you need to save yearly is less due to compounding. Compounding can only take place if you leave the interest and principal untouched until your goal is reached. 12.8 cents of every dollar you pay in OASI taxes is set aside to pay future benefits. In 1944 Altmeyer testified the cost was 7% of payroll. This means 7% of your wages should be set aside in order for Social Security to pay the benefits they have promised. Based on the 12.8 cents set aside out of each dollar, social security is setting aside just 1.36% of payroll. This is 19% of what is required. When exactly did Enron go bankrupt? Did it go bankrupt when it filed for bankruptcy or when it began using irregular accounting? Social Security is not going broke it is broke!! Today I completed my TV mini series on Social Security called "Snookered." Show #1 dealt with what went wrong with social security. Show's #2 and #3 dealt with changes and how Social Security works. Show #4 dealt with the magnitude of change needed to make a difference. Robert Ebeling who proposes we sell federal lands. Robert Ball who proposes five small changes. It should start airing after April 17. We are also looking at doing a live call in. New Campaign Signs are in! My new signs are in. If you would like having a sign in your property, please give me a call at (260) 637-0741. If you would like to help put some signs up in your area, that would be greatly appreciated. The Northside Neighborhood Association is hosting a Candidate Forum on April 10, 2006 at 6:30 PM at Northside High School. Entrance off Parnell. I will be there to answer questions and will have sign, fliers, bumper stickers and buttons. Please come and support my campaign. very, very informative. He does a very good job. Steven Camarota, Research Director for the Center for Immigration Studies, discusses the guest workerprogram. 3/29/2006: WASHINGTON, DC: 45 min. The idea that natives will not perform jobs is just plain wrong. Occupations with highest immigrant participation have 22 million natives in the same occupations. There are 14 million less educated natives in heavily immigrant occupations. If there were jobs that natives would not perform, then there would be few natives in these occupations. In the highest concentration of immigrant occupations there are 1.7 million natives unemployed. better-educated and more affluent natives. States who saw largest share of immigrant workers saw largest decline in less educated native employment. Share of less educated native workforce declined by 5% locally and 3% nationally. Less educated natives left the workforce in greater percentages in states with highest immigration. Immigrants do much better at networking in terms of getting job. They already have the highest unemployment rate, the lowest wage rate and employment participation among less educated has declined dramatically. Low voter turn out is a real embarrassment when you think about it. In many countries they have no right to vote or if they can vote, there is only one candidate allowed. I have spoken to many that do not vote and have been told several reasons. Many think that registering to vote increases the chance of being called to jury duty. The reason they do not want to sit on a jury is they cannot afford to take the time off from work. The jury pool selection comes from a ombination of sources with driver’s licenses and voter registration being the largest lists. If you have a driver’s license, your name is in the jury pool. Many have two jobs. Many have to be at work at 6:00 AM when the polls open and with a second job, they just do not have time. Then there is the family and kids answer. I have to be home when the kids get on the bus and then go to work. By the time I get home, take the kids to their activity the polls are closed. They cannot go at lunch becuase their polling location is across town and they get only 1/2 hour for lunch. In Indiana the polls open at 6:00 AM and close at 6:00 PM. For most of us, we work during the day. This means if we all voted either before or after work we would crowd the polls. Its a fact the two busiest times to vote is before and after work. It is this waiting or delay getting to work that is the most concern to people. If your work schedule is such that you are off between 6:00 AM to 6:00 PM, then it is much easier to vote. Pick a time when few vote: in and out quickly. I propose in order to honor our forefathers and their sacrifices made in the building of this great land, that we give up Presidents Day as a national holiday and in its place we have Election Day as a national holiday. What better way to honor all our forefathers than to show respect by voting in support of what they created. Are my posts informative or boring? I am using this blog as a means to answer questions, present my views that I cannot do on my web site easily. Do you find the information I post to be of use or interesting? Or do you find my posts to be long-winded and boring? Your feed back would be greatly appreciated. 75 year solvency period. Do we have time? I have received many inquiries telling me that making small changes now can make Social Security solvent over the next 75 years. Is this true? Social Security actuaries calculate the actuarial balance of the OASDI programs as the present value of Social Security system expected revenues minus present value of scheduled expenditures over the period in question. Social Security actuaries are required by Congress to make long-term calculations, and the Office of the Actuary has typically used a 75-year valuation period for this long-term analysis. The current system is not in actuarial balance. The 75-year shortfall is equivalent, on average, to 1.86 percent of the nation’s taxable payroll. This measure is a convenient shorthand for quantifying the magnitude of the financing shortfall, averaged over the valuation period. A disadvantage is that this measure conceals trends in shortfalls. For example, the 1.86 percent actuarial deficit of the current system hides the fact that Social Security has surpluses today but will experience even larger shortfalls in 75 years exceeding 6 percent of taxable payroll. Another disadvantage is that the 75-year time horizon is arbitrary since it ignores what happens to system finances in years outside the valuation period. For example, we could eliminate the actuarial deficit by immediately raising the payroll tax by 1.86 percent of payroll. However, as we move one year into the future, the valuation window is shifted by one year, and we will find ourselves in an actuarial deficit once more. This deficit would continue to worsen as we put our near term surplus years behind us and add large deficit years into the valuation window. This is sometimes called the "cliff effect" because the measure can hide the fact that in year 76, system finances immediately "fall off the cliff" into large and ongoing deficits. Some think projecting out past 75 years has too many errors associated with it. How do you project interest rates, inflation, wage growth, life expectancy and more 75 years forward? How can the error be reduced and at the same time get a better idea of the magnitude of the problem? The first error is in including the revenues of all workers who will not be beneficiaries by 2081. Why should those born after 2014 who pay payroll taxes not receive the same level of benefits as those during the 75 year period? Excluding all who are under age 67 in 2081, (born after 2014) from the cash flow analysis shows the shortfall to now be 6.3 percent of payroll, not the 1.9 percent reported. In reality the problem is over three times larger than reported. However, even this would not be accurate or fair to those born in 2013. They would pay all their working years into Social Security only to receive full scheduled benefits for one year. Is this fair? We could improve the calculation by simply eliminating all workers contributions from the analysis that were born after 1981. These people will turn 60 in 2041, the current year social security is projected to be able to pay just 73% of scheduled benefits. The shortfall then increases to 10.9%. This is an increase of 103% over the current payroll tax! Using this method, the problem is over five times larger than reported and we have not changed the valuation period at all! Now we could take it one more step, but I think you get the idea. We could just as easy look at the cost associated with those over 65 now as well as the cost for those now 45 but in doing so use only those cash flows associated with those that age and over. This method does not require projecting past 75 years. In fact we could shorten the time frame to simply 36 years. This would consider paying simply those whom are currently beneficiaries scheduled benefits. The present value cost is an additional $4.5 Trillion or $28,125 per worker. The additional cost of paying baby boomers their benefits is $6.75 Trillion or $42,158 per worker and yet we still have not covered the cost of benefits for those under age 45. The largest errors are not in the assumptions, but in the methodology used. The present value cost of paying scheduled Social Security benefits is a staggering $14 Trillion in addition to all the scheduled payroll taxes by employees and employers plus the trust fund. This is nearly twice the national debt. The question to those under age 45 is; do you feel obligated to contribute $70,284 TODAY to those age 45 and over so they can receive full scheduled social security benefits? The question to those of us age 45 and over is; do you feel those under age 45 should contribute $70,284 to make up the shortfall in taxes we failed to pay to fund our combined social security benefits? Keep in mind you can pay this amount and still not receive full scheduled benefits because you fall outside the valuation time frame. Social Security is the single largest tax for workers, has the largest unfunded liability, can pay but 73% of scheduled benefits and affects nearly every citizen. There is no painless solution.